There are many books on writing out there for the budding writer and anyone who has started writing a novel will know how difficult it is to keep going. Many things are needed such as discipline, inspiration and did I mention discipline? We write because we love it and something otherworldly compels us to do so. I truly believe there’s a seed of a story in us all just waiting to be given the right conditions to grow. What we often need however, is a little guidance along the way and these are some of the best books on writing which will help when inspiration is lacking and procrastination comes ‘a tapping. This was actually one of the first books on writing I bought. 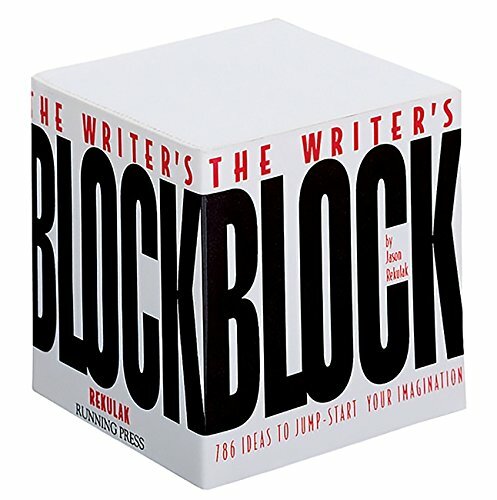 It’s literally a block and it’s full of inspiration for writers such as prompt words and story starters to really help fire your imagination. It’s the perfect little book to dip into for those all important writing exercises. This book really doesn’t need much of an introduction as the title says it all. The Artist’s Way is a beautiful book and the exercises contained within are both enlightening and inspiring. The likes of Martin Scorsese, Russell Brand and Elizabeth Gilbert say this book has helped them immensely with their creativity and I believe it has helped me too. As artists, we often become frustrated with ourselves. We all want to create something great and know we have the potential to do so but things just seem to get in the way. Enter Stephen Pressfield who is here to assist with your writing and artistic woes. This is a useful book which can really help with procrastination. It helped me understand myself more and has certainly helped me become more productive. I love Stephen King and he was one of the first writers I became enamoured with when growing up. The captivating way he weaves his stories meant that I would often stay up late into the night reading his books. This is the mark of a master story teller. This book takes you on a journey through his life as a writer and offers some great words of wisdom for aspiring writers. I’m a huge fan of poetry and I love writing my own. Anyone interested in writing should read this book as it’s so witty and entertaining. After introducing the reader to the many different types of poetry and their origins, the book offers exercises so that you can practise writing them. It really is an essential read, not only for those interested in writing poetry but for those who are interested in the art of writing. These are some of my best books on writing. Do you have any recommendations you would like to share?